Southpoint Divers is reputedly the oldest PADI 5 STAR Dive Center in Key West and is located on Front Street across from the Hyatt Resort and Marina. The company opened shop in 1991 and offers diving charters aboard the M/V Phoenix, a 46' Newton Custom Dive Boat. The customized boat includes a camera table and buckets, fresh water showers, storage space and two dive ladders as well as a large swim platform. The ship is capable of ferrying 40 divers but the cruises never set out with more than 27 in order to ensure that everyone is comfortable and gets the attention they need on their trip. Southpoint Divers offers dive classes to beginning and advanced divers. Once you've learned how to dive or refreshed or built up on your knowledge, you can sign up for a charter trip. The company provides trips to the USNS General Hoyt S. Vandenberg, the newest ship to be added to the waters around the Florida Keys. The ship rests at the bottom of 140 feet of water in the Florida Keys National Marine Sanctuary. Trips also go out to the Cayman Salvager, one of the most famous shipwrecks in the area. You can also choose to take a trip to a reef and encounter the beautiful marine life in the clear waters of the third largest barrier reef in the world. 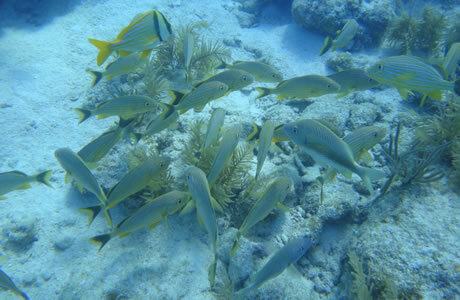 Southpoint Divers is one of the most consistently highly rated dive services in Key West. Both beginning and advanced divers say that they had a great time diving the Vandenberg and Cayman Salvager and enjoying the beauty of the reefs. The crew has a reputation as being friendly and experienced and doing a great job coordinating the dives. Customers also cite the convenient location of the dive shop as yet another plus.